The Skip Jack Tuna (Katsuwonus pelamis) is a speedy medium-sized school tuna. It can be caught around the globe and is easily recognized by the dark horizontal lines on their bellies. It matures at an early age making it more resilient to high levels of fishing than most other tuna species. Its preferred waters are tropical and subtropical waters in the 58 F to 86 F range The world record for a Skip Jack is 45 Lbs 4 oz. by angler Brian Evans. Caught at Flathead Bank, Mexico on Nov. 16, 1996. However most Skip Jack tuna caught by recreational anglers are between 5 and 22 pounds and measures 32 inches or less. This streamlined, fast-swimming pelagic fish resides in tropical surface waters across the globe. It resides in large shoals (up to 50,000 fish), feeding on other fish, crustaceans, cephalopods and mollusks. It is an important prey species for large pelagic fishes and sharks and is also a central commercial and game fish. 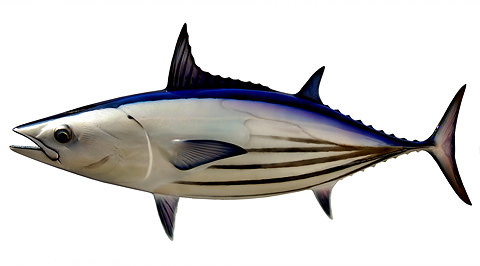 The Skip Jack Tuna is dark blue or purple along the back, while the belly and lower sides are silvery and have between 4 and 6 dark but broken lines running the length of the body. Like other tunas, the Skip Jack tuna has a fusiform (reminds of the shape of an American football, tapered at both ends) body shape. It has two dorsal fins; the first with spines. It has a single row of small conical teeth. Skip Jack is the most fertile of the main commercial tunas, and its population is currently considered sustainable against its present consumption. Its fishing is still controversial due to the methodology; with rod and reel or fishery options being promoted as ecologically preferable.